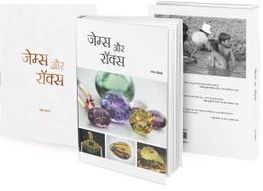 Glass is the most common gem simulant, and can show a wide variety of colours, transparencies, and optical effects. Most examples display similar features--namely gas bubbles, swirl marks, and devitrification effects--but in the last few years I have encountered some interesting and unusual glass specimens (see e.g., Gems & Gemology, Summer 2007 GNI, pp. 174–175; Summer 2010 GNI, pp. 155–156). 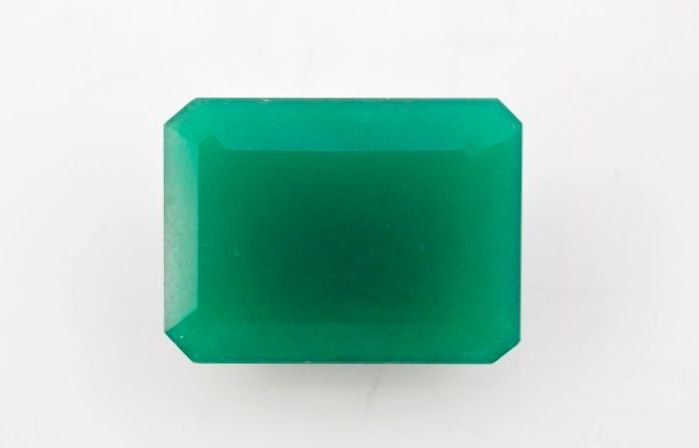 This report is based on a green 25.04 ct octagonal step cut measuring 20.04 x 14.86 x 6.36 mm (figure 1) specimen which I received at the Gem Testing Laboratory, Jaipur. 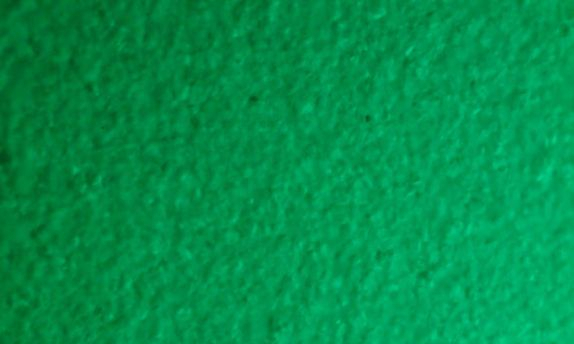 It had the translucency of chalcedony and the colour of emerald. None of emerald’s distinct inclusions were observed microscopically, however, and the heft was sufficiently high to rule out emerald or chalcedony. Microscopic examination with fibre-optic light revealed aggregates of colourless crystalline features throughout the sample (figure 2). The crystals were easily resolved at higher magnification and were much larger than those found in cryptocrystalline materials such as chalcedony. The presence of these crystals initially suggested a natural origin. Figure 2: The glass specimen in figure 1 displayed homogeneous colourless crystals throughout, giving it an aggregate structure. Magnified 60x. Standard gemmological testing, however, revealed the following properties: RI—1.745; hydrostatic SG—4.33; aggregate reaction in the polariscope; UV fluorescence—chalky blue to short-wave, and inert to long-wave UV. These properties indicated a glass, which was confirmed by FTIR and EDXRF analysis. The IR spectrum displayed twin humps between 3600 and 2600 cm-1 and complete absorption up to 2500 cm-1, while qualitative EDXRF revealed the presence of Si, Ca, and Pb, the last being responsible for the high RI and SG values. During a subsequent microscopic examination of the sample after the above testing, one gas bubble was finally resolved. Figure 3: A typical FTIR spectrum for most of the glasses display twin humps between 3600 and 2600 cm-1 and complete absorption up to 2500 cm-1. Crystalline features have been reported previously as inclusions in glass (see, e.g., H. A. Hänni et al., “A glass imitation of blue chalcedony,” Journal of Gemmology, Vol. 27, No. 5, 2001, pp. 275–285; Gems & Gemology- Lab Notes: Spring 2008, pp. 70–71; Summer 2010, pp. 144; Choudhary, 2009); these are attributed to partial devitrification. Hänni et al. (2001) identified the transparent and colourless crystalline inclusions as wollastonite, but those in our sample could not be identified with the techniques available. Such specimens make very convincing gem simulants. In the absence of proper gemmological testing and FTIR/EDXRF analysis, there is a strong possibility of misidentification.